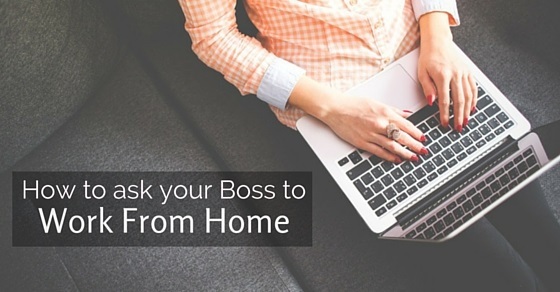 How to Ask your Boss to Work from Home? Making a plan beforehand is the first and foremost requirement. Instead of having an informal conversation, it would be better to formulate the plan and design a proposal for the boss. In that plan you will have to write everything from specific working hours to explaining the process of being at phone, email, IP messenger or whenever required. Your boss will not accept your proposal if it does not benefit his company at large. So you should make sure that your proposal must have something in it so that the boss refuses to deny the proposal. You can explain about how other colleagues will benefit from your proposal and also what returns the company will get in turn. If you have any family issue, then also tell your boss. The genuine reasons are always welcomed by the bosses. You can say that your baby is too small to leave him or her alone at home. You have to manage your home as well as your work and you are not able to do it effectively. Tell your boss that if you work from home the output would be more effective and you will be able to concentrate more at work than in the office. You can explain about the distractions that you face while you are in the office. You can say that you like to work in a peaceful atmosphere and that you get at home, which also helps you in getting the work done flawlessly. Your boss will surely put forth some of the blistering questions on you and this is your job to answer them effectively by doing the research beforehand. The questions you may come across is against your proposal. In that case you will have to be prepared to protect the proposal you came across. If some of the mistakes are told to you, do not deny that instead accept those and try to make changes in that and then come again with a better plan. This will not only show your dedication, but also your interest towards that plan. Being true is must but many times being true makes you fall in the pit, that you certainly don’t want. So by being true also be vague in telling the reasons to the boss. You can tell the reasons like the time is not suited to you and due to which you are not able to manage your home. Any of the personal problem can be told, but make sure those problems are realistic to some extent and are also reliable. The plan may also have some of the flaws, but before you present it, make sure you have something to address the concerns also. If you are coming up with the ideas, then also be sure to have the strong solutions in case the idea fails. Your plan will only be successful if it has something relevant and in the interest of the boss as well as the company. You should build faith and trust with the boss and the other staff members. Boss will only allow you to work at home if trust and faith run supreme between both of you. You will have to make sure that you work uninterruptedly and honestly at home. For this you will have to build the trust factor. These things need influential attitude. You should have that so that you are able to influence your boss effectively. All the trick lies in the way you speak and communicate with your boss. So, learn the tact of communicating and answering in a smart manner. You will have to bribe your boss with some perks into your plan, that you will present to your boss. The perks may help you in getting a positive response from your boss. You can do a trial once, not with the boss, but with the employees. You will get an idea, if your plan will succeed or fail. So, try it once before reaching the boss finally. The trial is a best way as it tells about the extent of success the plan can get and in case the plan fails, you get another chance to make a new one with distinct and better features in it. You can explain about the efficiency level that could be achieved by working at peaceful atmosphere i.e. at home. May be you are one of those who love to work in a comfort zone than in comfort places. So, also explain the same to your boss with examples and prove it so that the idea does not get rejected. Do not make it a formal conversation instead let it be little informal. The informal conversations will make the talk light and maybe your idea floats happily in the mind of boss and you get a big yes. So, try and make the conversation normal and informal. Your boss will believe you only if the company will have no loss of your working from home. For this you will have to show the boss by working from home for one day or two, to present the best results. So, move ahead by giving the demo and you will see boss head nodding in a fair response. Many people among your office mates may be working from home, but you will have to prove how reliable you are than others. You will have to tell your boss that there is no risk involved in allowing your boss to work from home as you will be more available than you were in office. Also, you will get time to work early without wasting time in commuting in the morning. Be super responsive and don’t only meet the deadline, make sure to beat the deadline as early as possible. Also keep with you an emergency plan. You should also keep the plan of reaching office in case emergency demands. You will have to be the person who shows the solution immediately if in case one plan fails to exist. Tell that you will always be ready to commute from home to the office in case any trouble arises. No office, no back pain, more relaxed, healthier environment and ultimately fewer sick days. This is in itself an achievement for you as well as your company as you will never fall sick, nor will your work suffer. What else is needed by the company. Many employees will be happy to hear this plan and even if any of the employee is willing to leave the organization,he or she will never leave, hearing this plan. You should allow flexibility in your plan wanting to work from home, helps retain the employees and the company talent. So, by this way you can impress your boss by explaining more of the advantages than the disadvantages of your formulated plan. Tell your boss about the effectiveness of the plan. Also tell how productive the plan will be. A single plan will serve two purposes like first it will satisfy your working conditions and also the companies demand as per it’s rules. You will be able to work even if you are out of the town as it will only take internet access. You will be able to work for a longer time if at home. You will rather not feel tired and will work for longer time span. This is something boss will feel excited and will stick with wide eyes. So, above are some of the ways in which one can impress the boss about working from home. One should focus more on the advantages that a single plan offers and should ignore the disadvantages. If more will be the benefits, the more will the boss be happy and the chances of getting yes may increase to a larger extent. Previous articleHow to Recruit, Interview and Select the Right Employee? Next articleHow to Give Constructive Feedback after Interview? How to Build Trust with Employees as a New Boss?